Ever see a build so insane, lovely and delightful that you know you just have to watch it in action? Someone stuffed the legendary boost monster 3.0-liter 2JZ-GTE engine from a Toyota Supra into a humble Toyota Tacoma, and it is my everything. 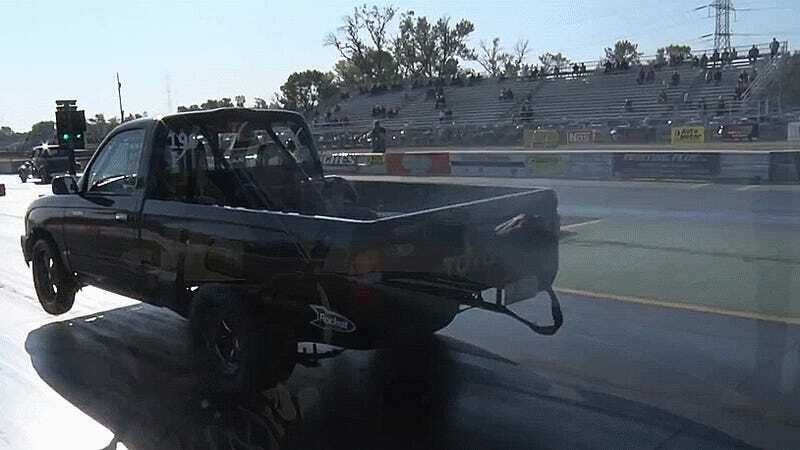 The Supra Taco has been tuned up to 975 horsepower using an insanely large single turbo and E85 fuel. Its builder had a Toyota Supra he ran last year at Drag Week, but then decided—nah, the Supra might get wrecked. Let’s stuff its guts into a Tacoma pickup truck and bring it to Drag Week 2017! The engine suffered internal damage on one of its Drag Week passes and had to be rebuilt before it runs again. Clearly, this is too much winning for even the truck itself to handle. There’s something hilariously rowdy about a Tacoma with a big turbo sticking through its grille and a drag chute on the back. It was even violent enough to knock the truck’s turn signals off on one pass. But holy crap, this thing is fast. That’s 161.63 mph in a Tacoma. Ta-co-ma. You know, your buddy’s truck you borrowed for your last Home Depot run. Dang.